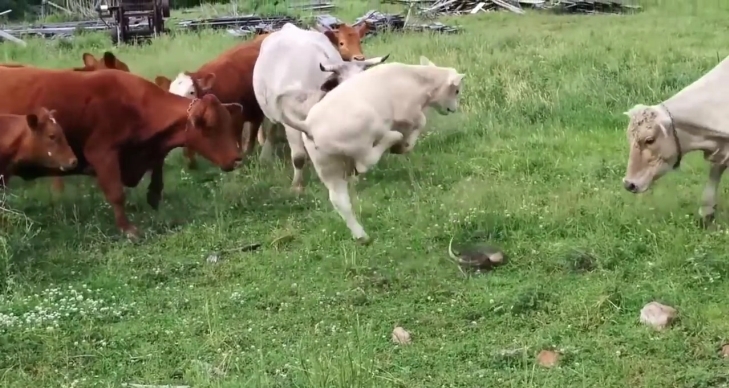 This herd of cows didn’t know what to make of a turtle that found its way into their field. The large herbivores seem scared but curious. It’s the calf who ends up being the most curious and brave. The youngster goes right up to the turtle and gives it a sniff only to freak out the entire herd with his reaction! Who knew turtles could be so scary? Such was the case with these cows. They greet the arrival of a new rock-looking thing in their meadow with understandable suspicion. This "rock" probably does not smell like a rock and mostly likely moved a little bit when it was sniffed. Not only does this thing — whatever it is — not belong, but they don't know what it is. Enter a young calf, bold enough to step forward for a prolonged investigation into this new object. While the rest of the herd cowers, this brave soul clomps up and takes a good long sniff and prod ... only to be rewarded with a surprise wack to the nose from the now-revealed turtle. Seeing their hero fall — or, rather, jump really high in the air — the cows all make for the other end of the pasture to give this mysterious creature all the space it wants. Responses to "Cows See A Turtle In Their Field And Have The Funniest Reaction"
lol they have probably never seen a turtle before, but in this case they are wise to be cautious. that is a snapping turtle, and they have a notorious bite.